Imported from Great Britain, these tender, boneless and skinless filets are ideal for the popular French dishes like Sole Meuniere, Sole Almanine or Sole Aux Gratin. “The flavor of the Dover sole is mild and sweet, elusive and enticingly different from more mundane white fish species. It’s a special indulgence and always worth extra care and expense”. Eight 7 oz skinless boneless fillets. Flash frozen to be perfect when they are cooked. 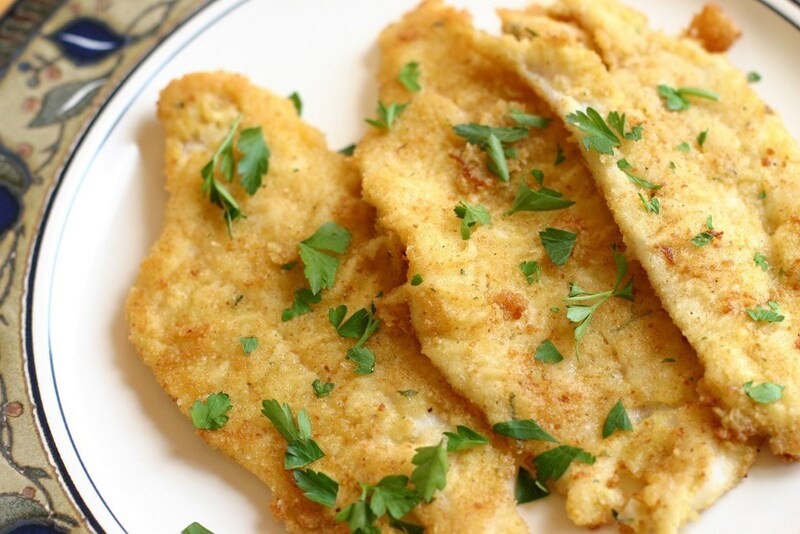 Place thawed Dover Sole in regular flour, shake off excess. Dip floured Dover Sole in egg wash, roll in panko-nut mixture. Place on waxed papered cookie sheet and put in refrigerator for a minimum of 2 to 3 hours. Place 1/4 cup oil in non-stick frying pan till hot, add Dover Sole, fry one side for two minutes (till brown) gently turn and brown other side. Spray cookie sheet with pam, place cooked Dover Sole on cookie sheet and bake in oven for 12 to 15 minutes at 350°.